Last week we got to see the first trailer for Gambit, the upcoming con comedy scripted by Joel and Ethan Coen starring Colin Firth. In the preview the Oscar winning actor is seen in a number of compromising situations and acting foolishly, the end even featuring him walking out of a building without his pants on. The film looks madcap and goofy, which makes it a very interesting contrast with The Railway Man, from which today we have the first two stills. Instead of being a fun romp, the Jonathan Teplitzky-directed film is instead a dark drama, telling the true story of a British officer named Eric Lomax who was captured by the Japanese during World War II and sent to a prison camp where he was forced to work on the Thai-Burma Railway, which earned the nickname "the Death Railway." During his imprisonment he was tortured and horrifically mistreated, but managed to survive. Years later, unable to let the experience go, he was convinced by his wife, Patricia Wallace to find his captor, Japanese officer Takashi Nagase, and try to find peace. 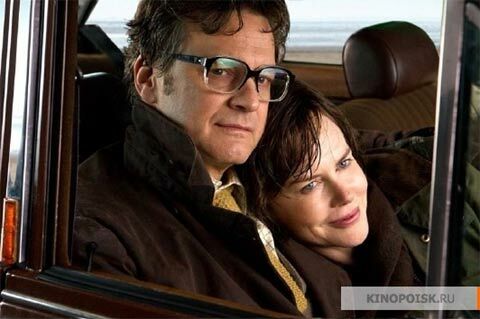 In the movie Lomax will be played by Firth while Nicole Kidman will play his wife, and today Kinopoisk (via The Playlist) has posted our first look at the movie. You can see the images below and head over to the source to see them full size. The Railway Man's cast also includes War Horse's Jeremy Irvine (as the young Lomax), Stellan Skarsgard, Hiroyuki Saanada and Sam Reid. The film does not yet have a US release date.